Grevilleas include both small to very large plants (from prostrate ground covers, through small and medium shrubs up to large trees). Their hardiness is variable according to species. The foliage is also variable ranging from small, entire leaves to lobed or pinnate leaves. All are arranged alternately on the stems and some have hairy under surfaces. Most have a medium to fast growth rate. There are a variety of different ways that different “experts” have classified species of Grevillea, into groups; as a way of helping identify and understand the differences between the species. Here are some of those classification systems. You may decide to use only one of these systems, or all. Being aware of a system either way though, makes it far easier to understand and remember names and characteristics of different species. The erect cluster - flowers occur as an upright cluster at the end (or tip) of a branch or stem. The styles point in all directions - 360 degrees, like the bristles at the end of a bottlebrush e.g. Grevillea buxifolia. The toothbrush flower - the styles point in basically the same direction, like the bristles on a toothbrush. Flowers occur at the ends of stems or branches e.g. Grevillea hookeriana and Grevillea acanthifolia. The pendant cluster - where flowers occur at both growth tips (i.e. ends of foliage) and along the branches in a spider-like form (i.e. styles pointing in all directions), like the end of a rounded bottlebrush e.g. Grevillea victoriae. The cylinder type flower head - where flowers occur at both growth tips and around the stem. Flower heads tend towards the shape of a cylinder like the middle of a bottlebrush e.g. Grevillea banksii. The soft feathery flower type - these are formed in loose open terminal spikes. D.J. 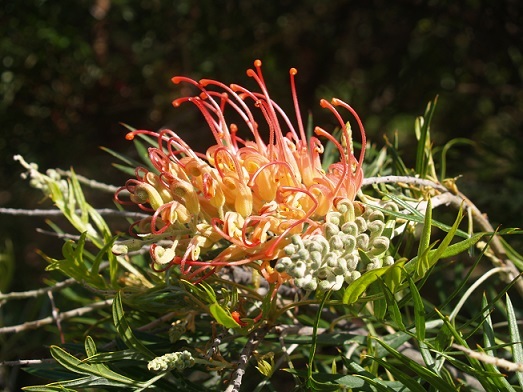 McGillivray published an arrangement of species involving 11 groups, in 1993 (Grevilleas – A Taxonomic Revision, by D.J. McGillivray, Melbourne University Press, 1993). This arrangement is helpful in differentiating species. However, one group is not mutually exclusive of another group. The way to use this system is to look at a small number of key characteristics. If a plant has a smooth surface on the flower parts (no hairs) and a flattened under-surface to the leaf you can place it in group 1. In doing this, it will narrow down the number of possible species for you to consider. If it has a smooth surface on the flower parts but curled edges underneath the leaves (partially obscuring the under-surface), this will cause it to be placed in group 3, which will in turn give you a different range of possible species to consider. Most species that fit into one group do not appear in another group, but there can be exceptions. For example, G. rosmarinifolia appears in both group 1 and group 3 because the under-surface of the leaf may or may not be obscured. In their 1994 book, Peter Olde and Neil Marriott break the genus down into 41 different groups. These groups are differentiated on the basis of a wide range of botanical characteristics including: leaves, flowers, fruits, growth habit, and size of plant.